This only took a few minutes to implement and is done in realtime. While it looks cool, I'm not sure about the gameplay implications. What should be in darkness and what should be in light? Is it purely for atmospheric reasons or is there a gameplay element to the darkness? Currently you can watch enemies make all of their moves, and so they really need light on them as well for this to work. Alternatively, I could just place a lot more light sources on the map, such as torches on the walls. Those shadows underneath the players are also temporary in case you were wondering. Dusty is also working on some new coins and doing the shadows for the wall tiles. * Spent all day listening to various musicians and artists. Finally found someone! Tomorrow I will release a playable build for those who have pre-purchased and I will talk a bit more about music and sound effects (got to finalize some agreement details). New in-game screenshot at 1080p! That looks really cool! I hope its like that in game too. One thing I'm not fond of is the upscaled UI (enlarged character, text, number) as it feels inconsistent with the rest of the image (especially when you're using a scanline effect). It is like that in-game and you can turn it on and off with a button for those who don't like it. I completely agree with the upscaled UI problem. I myself really hate it when "scaled" and 1x pixel art is combined. It just looks so... gah! It's just placeholder, so you'll have to try and not let your eyes bleed for a little longer until I finally get around to replacing it. I can confirm now that the extremely talented Nathan Antony, aka Derris-Kharlan will be writing an original sound track for the game as well as the sound effects.Check out some the his work on his portfolio such as Luminesce . I'm really looking forward to seeing what Nathan comes up with! Follow him on Twitter. I will also be getting out a playable build this evening for those who have pre-purchased. I'm so excited today! My mind is full of creative ideas and things I just want to put into the game. I've got a lot of new ideas on how to streamline the movement and gameplay as well to make it as fun and useable as possible. IN DEV Build 1 of Dungeon Dashers is now available to play for all those who have pre-purchased. If you’ve bought the game you should have received an email by now with a download link. 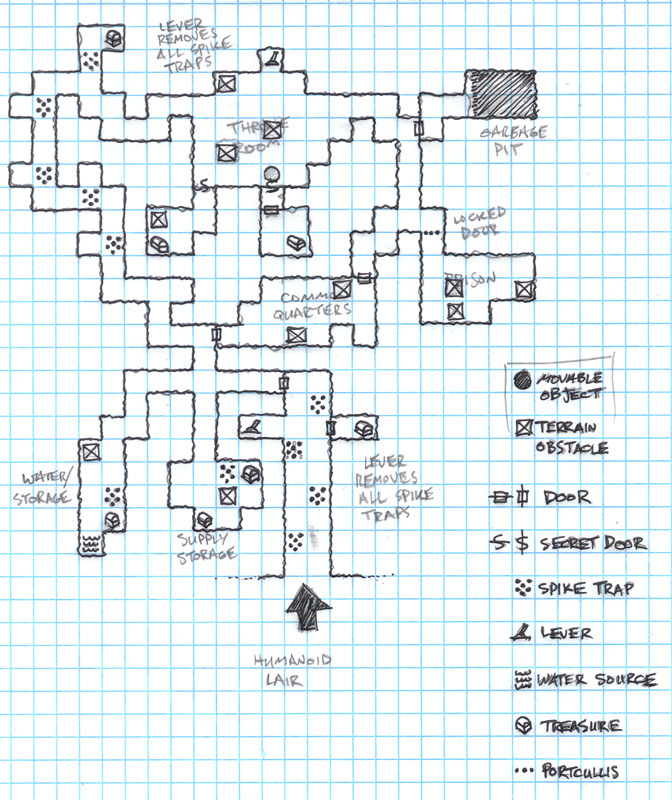 I spent all of today fixing up the build to make it work well and polishing it up There’s a fair few different monster types, and some treasure chests to open as well. Now I can spend the weekend participating in Ludum Dare! Do you think it could be good to have a HP bar above hurt enemies? Also I'm not sure I noticed if it automatically went to the next turn once you'd moved/actioned, which might be good. The code for hurt bars above enemies is in there. Though I turned it off for now. It looked a bit messy when every single enemy had a health bar. So I'm weighing up some smart way of displaying it when it's relevant. 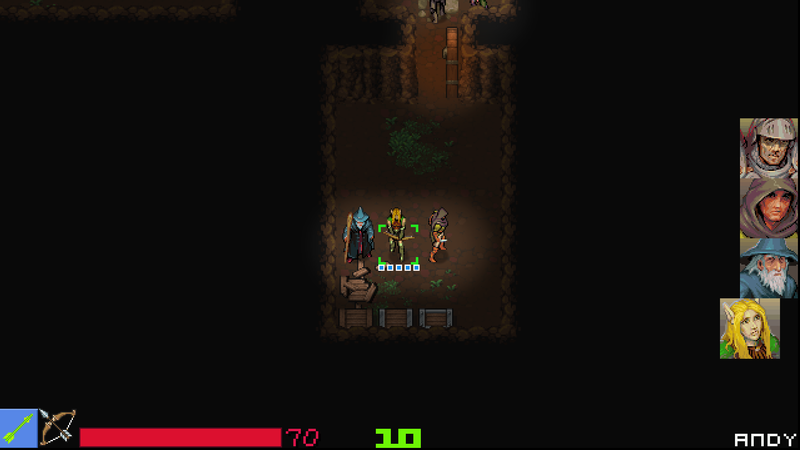 Once I put in mouse controls, it would make a lot of sense to display it when you hover over an enemy. Or I could take another route, and not let you know the enemies' health like it is now. As for automatic turn ending, I'm going to put in a new movement system next build, which should be a lot more intuitive than the current one. I admit that the current one is a little clunky and I want to make it all a lot more intuitive. It doesn't automatically end a turn right now because I thought that might be confusing and inconsistent. It shouldn't end a turn straight after attacking either, because you might still want to walk away (a strategic element that I definitely want to leave in). The next system I change it to will be based around movement points purely. So an attack will take, say, half your movement points and that means you can spend all your points running, or you can use them to attack once and move, or you can use them all up to attack twice. I expect this will be a lot easier for the player to follow, and also removes the need for a "sprint" skill. There will be some more additions to make it smoother as well. That new system sounds really good. Well what I meant was, you could just show the bars for enemies when they've received damage (not when they're full HP), so you know which ones you've hurt (since you're probably not going to do different animations for each enemy once they've been injured). That's another good idea. I think it's one of the best too. It will give a combination of being able to see the enemies' health, as well as not over-cluttering the screen. Thanks! This looks so cool!! have to try it out! PS. I'm linking via a CDN now, tell me if the images don't work properly. Testing it out. Big update today! A lot of assets got completed over the weekend while I mostly worked on my Ludum Dare entry. In addition to the graphics below, Nathan also near-completed a couple of tracks which sound amazing! I'll be sure to include those in the next development build for pre-purchasers. Alex is working on the other character portraits and some new enemies soon. Another announcment I have to make is that Stephen Thomas, better known as 's-m-r' on The Daily Click, will be doing a large number of quest/level designs for the game. I'm really excited about this because it means I'll be able to focus more of my effort on the coding and also get some new gameplay ideas from Stephen's creativity. Stephen has played tabletop RPGs and designed his own campaign resources and scenarios for over 15 years and been in board game design for over 3 years. And as for me, I'd like to keep adding in new enemies to the game - especially some ranged ones like the goblin archer to mix up the gameplay. Then I'd like to take a look at streamlining the movement/action system that is currently in place as I think it could be a lot better. I've been really excited about developing this game the past couple of weeks. It's all coming together now, and it's a lot of fun to make Hopefully that will show in the finished product! The goblins / ranged enemy gives a good new feel to the game. I can already see how having unwalkable obstacles like a lane of lava will cause a lot of panic and strategic choices for the player when they can't get close enough to the enemy. I've changed the way that the movement system works, which I've been intending to do for a while. Now there is no longer a 'sprint'. The players have a large number of movement points (say 10), and when they attack it costs 5 movement points. This means that if your character has 10 movement points you can choose to attack once (5 points), and move once (move up to 5 spaces), or attack twice (2x5) and stand still, or 'sprint' and use up all your movement points to move 10 spaces. My original intent was to have an attack take up half of your characters maximum movement points, but then I thought/realised that a player wouldn't be able to intuitively track how many steps was half of their maximum. If this is standardized to 5 movement points then a player should be able to track it easier. I have also dabbled with a new UI element that shows your steps in multiples of 5, so you can infer how many attacks you have left. I'm playing with that anyway. So far it seems better than what was in before. Lots of cool cosmetic additions today, and some core fixes to how the Line Of Sight works. Took a while to fix that up, but now if there are two enemies in a row you can't aim at the one at the back, you have to hit the closest, i.e. you can't shoot through enemies, though are allowed to 'shoot through' the other heroes/teammates. There's also a new visual step indicator, which is kind of like a progress bar, and shows how many steps you have left in multiples of 5. Since it costs 5 movement points to attack, it works quite well and allows you to focus on the character without having to see how many movement points you have left. I'm quite happy with it.